Posted in Lama Zopa Rinpoche Bodhichitta Fund, Supporting our Lamas. One of Lama Zopa Rinpoche’s vast visions for the FPMT organization is to sponsor 1,000 Nung-Nä retreats. Upon hearing about Rinpoche’s vision, Institut Vajra Yogini quickly picked up the project of hosting these retreats and has now started a third set of 108 Nyung-Näs, from mid-November 2013 to mid-June 2014. More than 125 students from 12 different countries took part in one or more Nyung-Näs, accumulating an amazing total of about 1,000 individual Nyung Näs! Four people offered a consecutive year of their lives engaging in these retreats. The Nyung-Nä retreat is an intensive practice that carries great blessings and is highly praised by Lama Zopa Rinpoche as a supreme method for transforming the mind. The practice includes taking the 24-hour Mahayana precepts every day, with the addition of complete fasting and silence every second day. One does four – 2 ½ hour sessions of well-structured practice that includes meditation, prostrations and mantra recitation each day. It is a powerfully effective experiential practice that can be done by anyone with respect and faith for the practice. 16 people did more than eight Nyung-Näs, four of them managing to do more than 100 Nyung-Näs. This is something amazing in which to rejoice! Lama Zopa Rinpoche, through the Lama Zopa Rinpoche Bodhichitta Fund, sponsored some of these retreatants, as he had done for the two previous sets. The next set of 108 Nyung-Näs is scheduled from the November 18, 2014 to the 20th of June 2015. Lama Zopa Rinpoche is again offering sponsorship for up to 10 people able to commit for 100 Nyung-Näs. These Nyung-Näs will be led in French but people can follow simultaneously in English or any other language. 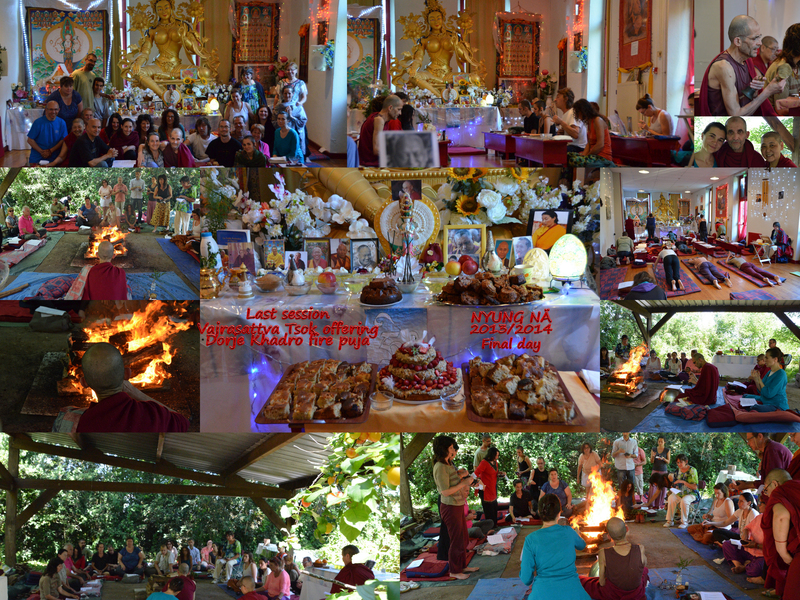 Everybody is welcome to join for one or more Nyung Näs, you can contact Institute Vajra Yogini to enter any number of these retreats (1-100) when they begin the next set. Contributing to the sponsorship of these Nung-Näs or completing one or more yourself is directly contributing to Rinpoche’s wishes. Nyung-Näs are a most powerful, most beneficial and quickest way for you to develop bodhicitta, to collect extensive merit to quickly achieve enlightenment, to become Chenrezig, to liberate sentient beings from the oceans of samsara suffering and bring to enlightenment….This is an extremely powerful practice, it in an incredible way to develop bodhichitta. You can learn more about the Lama Zopa Rinpoche Bodhichitta Fund as well as the other Charitable Projects of FPMT.